View of the circle in dappled sunlight, looking northwest. The forest is to the left beyond the fence. 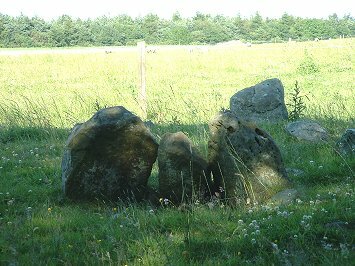 This small stone circle is also known as the Druid's Circle and situated just beyond the northeastern edge of the southern end of Harwood Dale Forest on Standingstones Rigg close to several cairn and barrows. 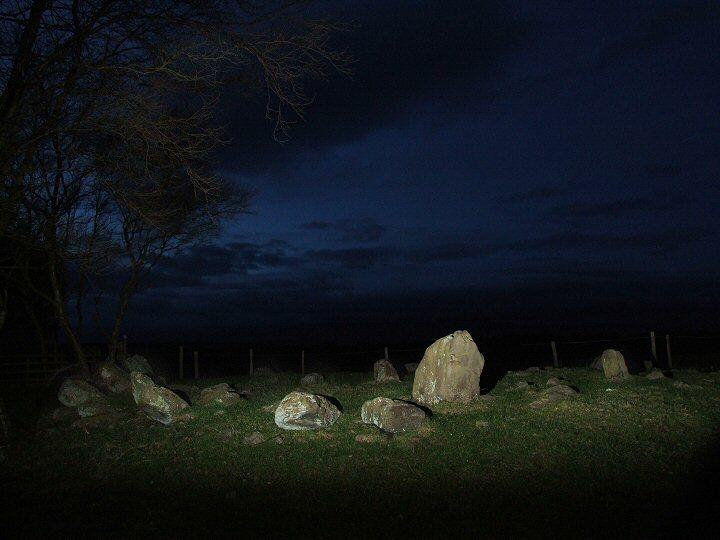 There are originally thought to have been around 24 stones here with the 15 that remain set into a low 14 metre earth bank, the circle itself having a diameter of 8 metres - it is possible that the earth mound extended over, and covered the stones but has since been eroded away leaving the circle visible. The tallest of the stones measures just over a metre in height while most of the others are much shorter and many are leaning outwards. In the centre of the circle are three uprights which are believed to have formed part of a burial cist - four of the stones from this cist were decorated with cup and ring marks and have since been removed to Scarborough Museum. Harwood Dale probably dates from the Bronze Age. Leaning stones on the northwest of the circle. 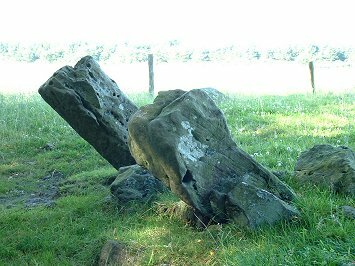 Three stones in the centre that formed part of a cist. Harwood Dale circle by night.